Submersible Pumps : ARK Petroleum Equipment, Inc. Since the mid 1950's, FE Petro's parent company, Franklin Electric, has been involved in the design and manufacture of submersible motors for use in pumping motor fuels. 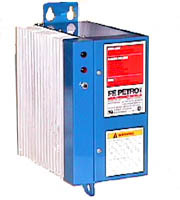 Building on this extensive history, FE Petro has contributed innovative product designs for submersible pumps throughout the 1990's. Marketers concerned about fueling times, efficiency, serviceability, reliability and overall product quality find it an easy choice to specify FE Petro. . The Variable Frequency Controller has continuous running diagnostics and displays system conditions on the controller.